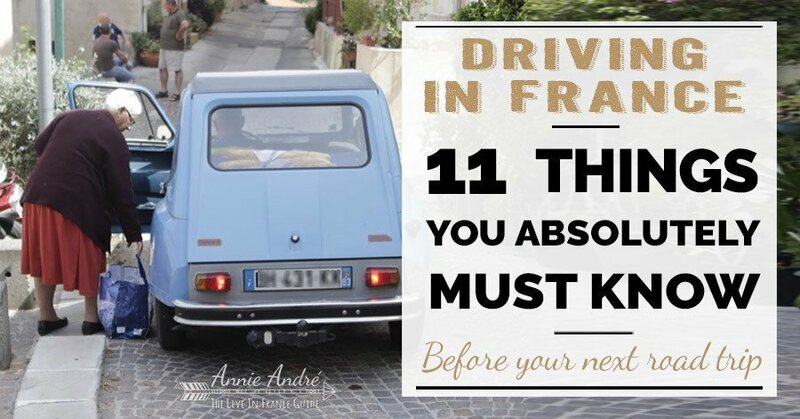 Driving in France is pretty straightforward, however, there are a few things that can be a little confusing to newcomers. Here are 11 things I wish I knew. France is a vast country and although there is an array of roads, from dinky one lane country roads to high-speed motorways, the three main types of roads you should familiarize yourself with are 1) Autoroutes, 2) National Roads and 3) Department Roads, each of which has a clever lettering and number system to help you tell them apart. In France, the quickest, most convenient way to get around is usually the autoroute, known in English speaking countries as a highway, motorway or freeway depending on where you’re from. The majority of autoroutes in France are toll roads (“Péage”) and are easily identified by the letter A followed by a number depending on the region. 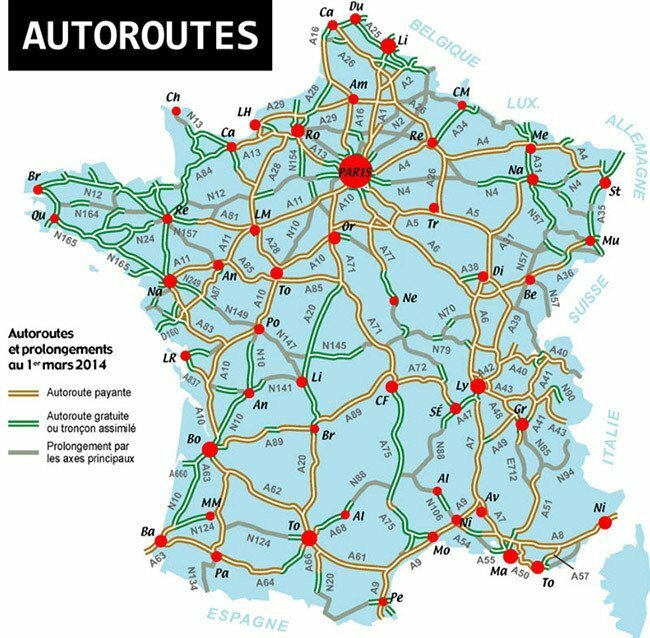 For example, A1 is the autoroute around Paris, the 40’s are near the Alps and the 60’s are in the south near Bordeaux and Toulouse region. (see number 3 below explaining tolls in more depth). If you’re not in a hurry and want to take a more scenic route than department roads are the way to go mainly due to having fewer lanes and lower speed limits than autoroutes. 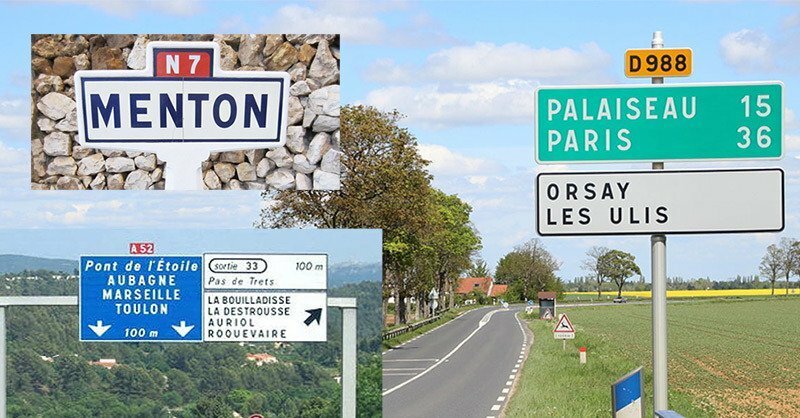 D roads are a great way to discover new towns along the way and get a view of the vast landscape of France because they often take you through cities and towns. Departmental Road signs are recognised by the prefix “D” followed by a number which are black with a yellow background, for example, D45, D34. Before there were autoroutes, the Routes Nationales was the highest road classification in France. Since National roads are trunk roads or trunk highways and are typically the shortest route between major centres such as ports, cities and airports, it’s usually the recommended route for freight traffic. National road signs are marked with the prefix “N” followed by a number usually in white lettering and red background, for example, N7. The roads in France have a variable speed limit that depends on the type of road and the weather conditions. 4 lane expressways: Usually 110 km/h. When raining, the speed limit is reduced to 100km/h. 2 & 3 lane roads: As of July 2018 speed limit reduced to 80km/h (56mph). When raining, the speed limit should be reduced to 70km/h. 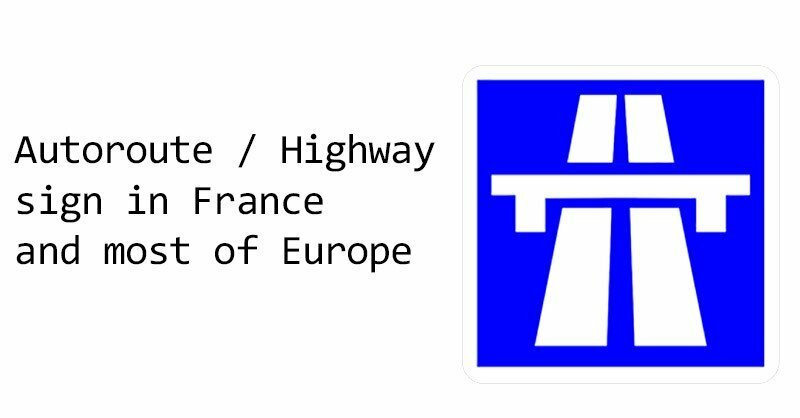 As I mentioned earlier, the fastest way to get around in France is usually the highway (autoroutes which start with the letter A) however, travelling on the autoroutes comes with a price because over 75% of all autoroutes in France have a toll fee. You’ll know a toll booth is coming up when you see a blue sign with the words “Péage” written in white lettering. “Péage” is the word for toll. Autoroutes across France are owned by various companies so you’ll usually pay more than one toll to get across France and the price you pay depends on the distance driven and the type of vehicle. We drove from the south of France to Paris on one of our road trips which cost us about 100 Euros in tolls round trip. The trip should have taken 8 hours but took us 10 hours since we made several stops along the way. 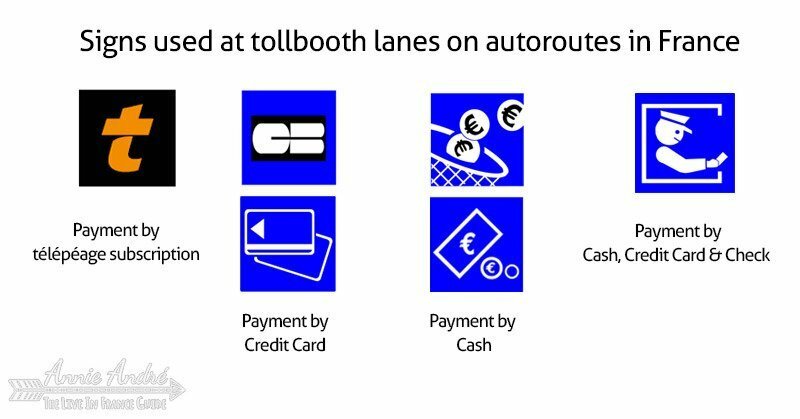 It’s really embarrassing to enter a toll lane that only accepts cash when you want to pay with credit card, so make sure you familiarize yourself with the signs above the toll lanes which indicate the type of payment accepted in that lane. NOTE: Sometimes foreign credit cards don’t work at toll booths so make sure you have some cash on hand to pay for tolls just in case your credit card fails. 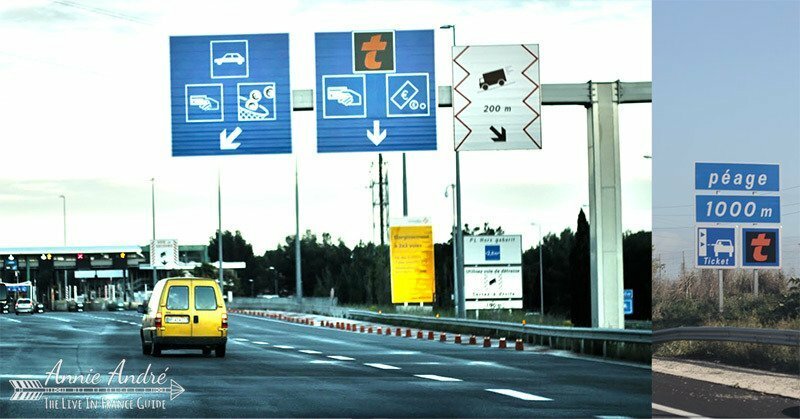 If you plan on taking the autoroute, sometimes it’s helpful to know how much toll fees will cost beforehand. 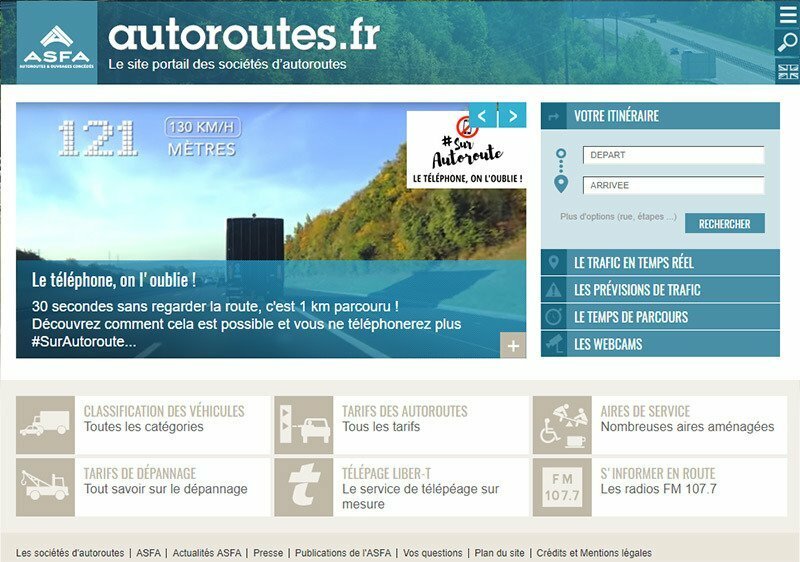 You can calculate estimated tolls by visiting the site autoroutes.fr where you enter your start and end point to get an estimate of toll fees one way. The site will also estimate how long the journey should take and how much gas will cost you. (see screenshot below of an example itinerary from Montpellier to Paris). If you want to avoid or minimize tolls, or simply take a more scenic route, the site can help you build a driving route using mainly D & N roads (Department and National Roads) which are toll-free. One of the benefits of taking autoroutes rather than the more scenic toll-free departmental roads are the REST STOPS at regular intervals along the way. On average, there is one rest area every 15 km with clean restrooms and picnic benches. Many rest areas also have restaurants and some have gas stations. To find a rest stop on French autoroutes, keep your eyes peeled for signs with the word “Aire De (some name)” on blue signs with white lettering. The French word Aire literally means area and each rest area has it’s own unique name. 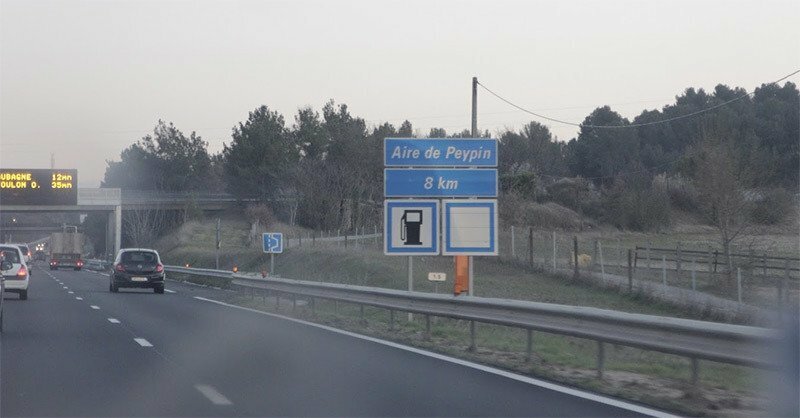 For example, the sign in the photo above indicates that the rest area called “Aire de Peypin”, Peypin area is another 8KM and has a gas station. 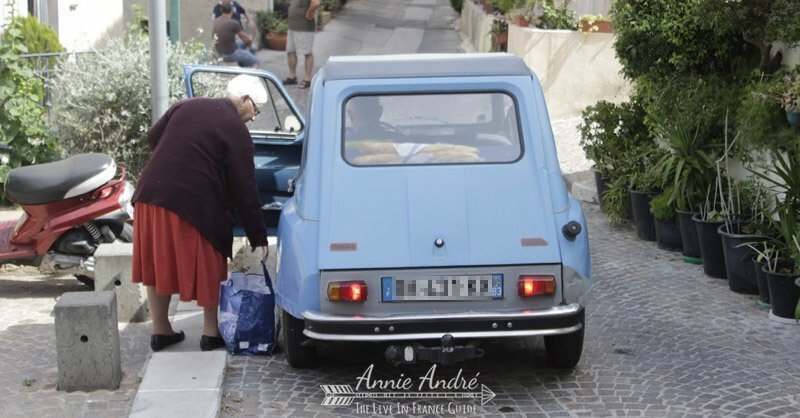 French law states, when driving in France, you must carry certain things in your car at all times. Source: French service website. Since July of 2012, all drivers must have a breathalyzer (L’éthylotest) on hand. You can buy a single-use breathalyser for around 1€ to 3€ Euros in a pharmacy, tabac shop or in some supermarkets. The tolerated blood alcohol level in France is very low, 0.5 mg. per ml which means one single drink can put you over the alcohol limit. 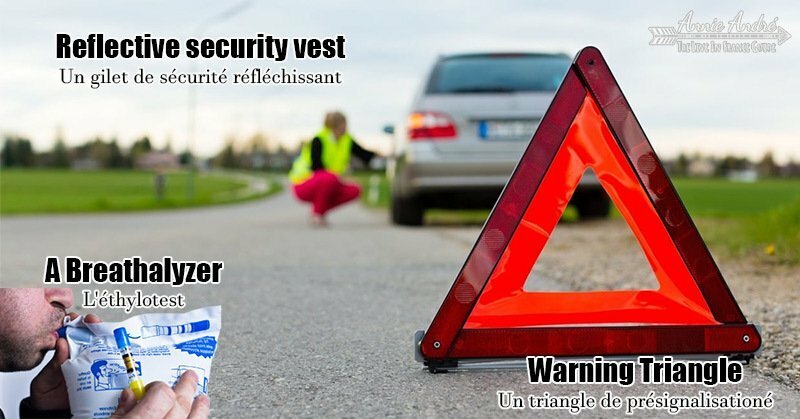 Since 2008, the law in France states that you must carry an approved warning triangle (Un triangle de présignalisationé) with the mark E 27R. If you have car trouble or need to stop on a public road, for instance, to change a flat tire, you must place the triangle 30 meters behind your car to give oncoming cars enough warning. You must also put your hazard lights on. The fine is 375 Euros if you don’t comply. French law also states that you must have an approved reflective vest (un gilet de sécurité réfléchssant) in your car which you must wear if you need to stop on the side of the road. The fine is 375 Euros if you don’t comply. A lot of Americans complain about traffic circles but after you get used to them you’ll love them and find they’re quite easy to manoeuvre. For now, here are the 3 basic rules you need to know. YIELD: Yield to traffic already in the circle. If you time it correctly, you don’t need to ever stop at a four-way intersection. Just slow down to yield then enter and exit. 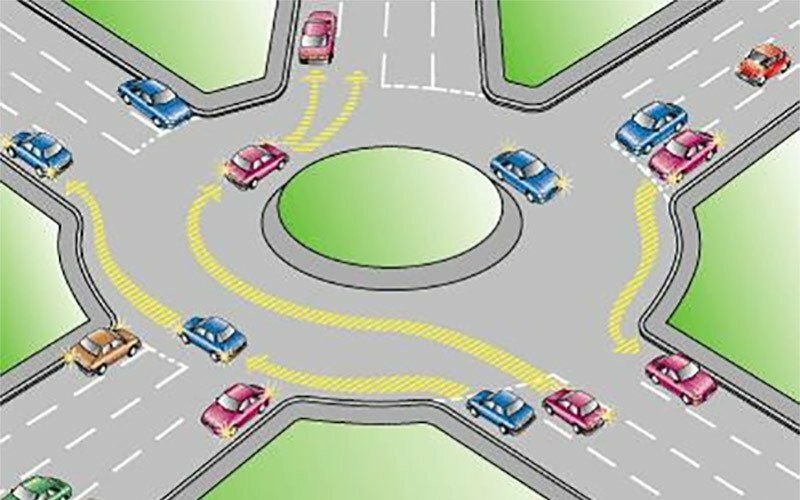 EXITING: When exiting a roundabout, put on your blinker to signal so that cars trying to enter the roundabout know you are exiting and can enter safely rather than waiting to see if you exit or stay in the round-about. MISSED YOUR EXIT: In a four-way stop, if you make a wrong turn, you have to do a series of turns around the block to get back but with a roundabout, you simply stay in the round-about and come around again to the correct exit. Huge time saver. 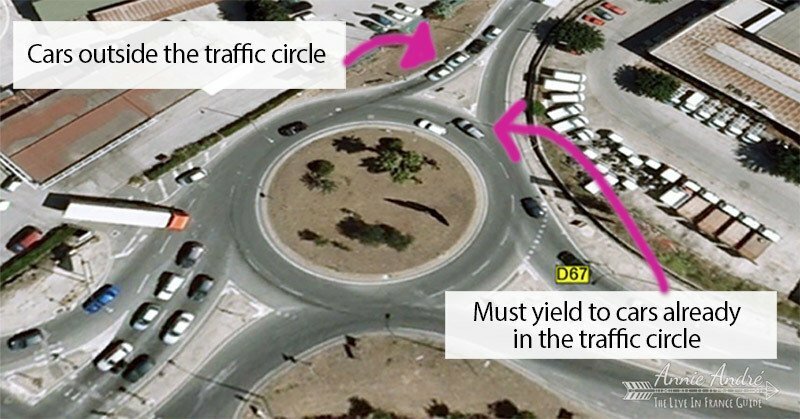 If you want to learn more, here is a site that has more detailed explanations about roundabouts. If you’re from North America, you’re accustomed to looking across the intersection to see the red light. 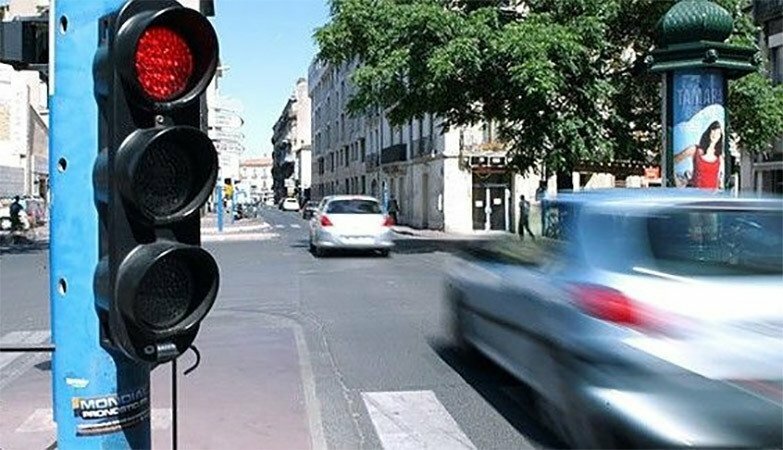 In France, however, the red light is on the same side of the street which can be confusing for first-time drivers in France. For example, if you’re the first person at a stop light, the stoplight will be located on your left or right, usually near eye level and close enough so that you can reach out and touch the light if you wanted. This is more of a recommendation rather than a requirement but I highly recommend getting a GPS device of some sort especially if you’re taking road trips. Here are my top five reasons. Gives you the flexibility to go to new places and stops without the fear of getting lost. Know where you are in an instant. Take detours or get lost and the GPS auto corrects your route to your destination on the fly. Calculates your total drive time for you almost to the minute. Has voice navigation that tells you of upcoming turns, exits, stops etc. 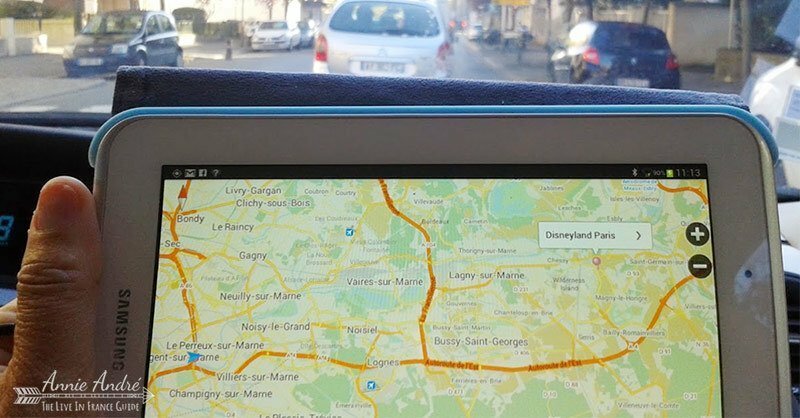 Handy if travelling alone or want to avoid constantly looking at a map. Or your co-pilot gets car sick and passes out like I usually do and become utterly useless in helping navigate. Tip: If you won’t have internet, you can always download a map on your device and use it to navigate offline. 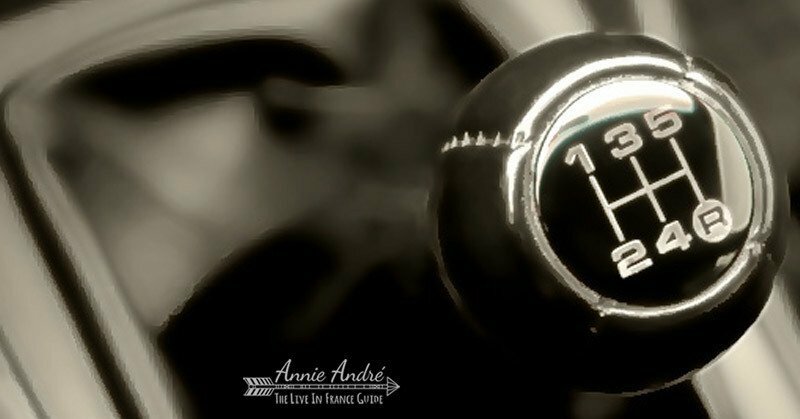 Most cars have stick shifts in France. If you can’t drive a stick shift and need to rent an automatic, you should call the rental company ahead of time to see if they’ll have one available. Some companies even charge extra for automatic cars. 11. 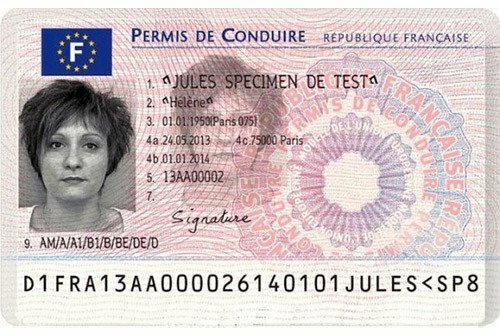 Do You Have The Right Drivers Permit or License To Drive In France? According to the official website of France, if you have an EU drivers license or drivers permit from another country, you’re allowed to drive in France as long as the following conditions are met. Drivers permit must be valid. Drivers permit must have been issued by the country in which you normally resided before moving to France. Drivers permit must be written in French or be accompanied by an official translation. ( we have managed so far without an official transcript, knock on wood). TIP: Although not required, it’s highly recommended that you get an international drivers license which can help to expedite encounters with authorities in the event of an accident or traffic infraction. If you plan on staying in France for over a year, you’re supposed to apply for a French drivers permit. Bon Voyage!! Did you check the type of gas your car takes? One last thing about cars in France. Most are diesel (at the time of this writing) which is called “Gazole”. Unleaded is called “sans plomb”.